I had to buy a product recently simply because of its name. IMfinite Wealth offered me the tantalizing prospect of not just earning non-stop flow of money, but also a product laced with puns! That was my hope at least! 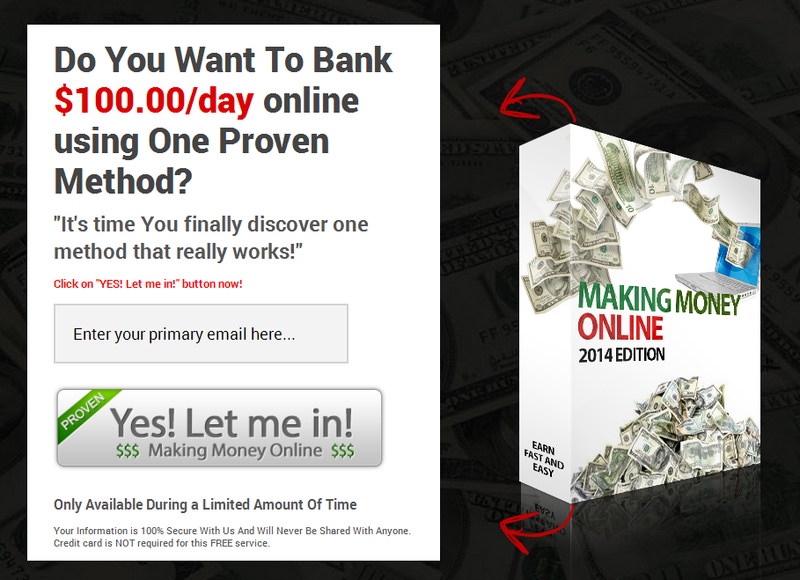 This product is aimed specifically at struggling internet marketers, but its premise is nothing new: teaching you how to create a sales funnel. Considering the product is offering so much wealth, it is going for cheap on a dime sale. The front end product is only $7.95, but this may rise to $17. The affiliate page suggests there are two downsells, one for a Bot Traffic system and one for a “done for you” system. However, I only saw the done for you system for $97. If purchased the product creator or one of his minions will set up your site, autoresponder etc. (of course you buy them first) and you even get a 45 minute Skype call thrown in. To be honest, I think it’s quite well priced. Consider how much it costs for any company to come to your home and set something up for you, plus the 45 minute call. I would probably charge something similar, though it is by no means necessary to buy. Rightly or wrongly, I think the product creator missed a trick by not promoting hosting, domains and autoresponders, but whether it was a mistake or on purpose it’s nice to see a limited amount of cross selling. There is no membership page for this product as such. After clicking the “no thanks” link for the upsell you product is automatically downloaded. The product consists of the core 45 page e-book, as well as 2 bonus e-books and a ready-made HTML funnel website. Event with a standard and earnings disclaimer, the e-book makes some pretty broad statements from the get go, including that I will live longer! How the author translates saving time into living longer beats me, but that is his assertion. The overall writing style was a little jarring: either English isn’t the author’s first language or he didn’t proof read the book. Most likely it’s both. Grammar and weird phrasing aside, it is well laid out. This means that even though it has few images, it isn’t just a wall of text which can be very off putting. Sadly there were no puns. The core premise of the book is setting up a funnel so nothing new there. While these topics are quite brief, there is definitely some useful hints and tips in there. If you are looking for hand holding on how to create an autoresponder email, you won’t find it in this e-book, but you will find tips on segmenting your audience. The author discussed at one point about using PLR content, and normally I would disagree as for the most part PLR content is garbage. However the way he advised to use it, in that you re-package it for the bait to lure users in, is spot on and probably the only good use for PLR content. 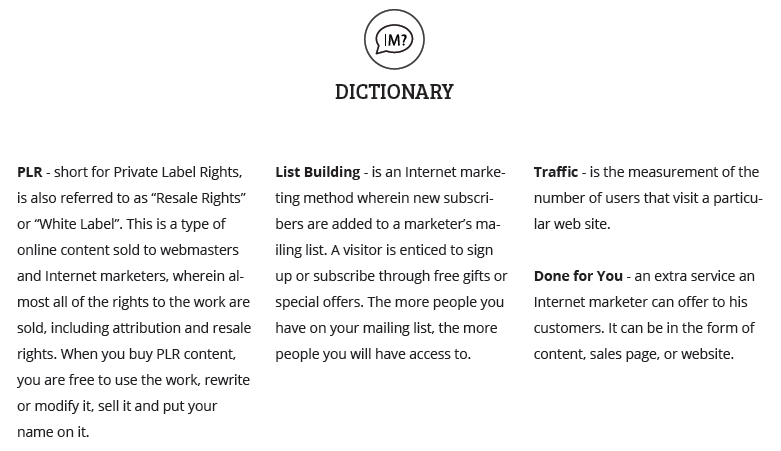 I also loved the IM Dictionary snippets he has dotted about the book which provide short and helpful breakdowns of different internet marketing terms. Typically, the traffic generation section covers a lot of internal marketer dealings, via Solo Ads and Ad Swaps. I personally don’t think these methods will create a sustainable business model, but you may disagree with me. I also think it feels a little scammy, what with the “I’ll send you X visitors, if you send me Y visitors” type system. There is no doubt though, that it does send traffic if done correctly. He did introduce me to a new term though: click banking. This is a kind of traffic swap, but based on click counts. 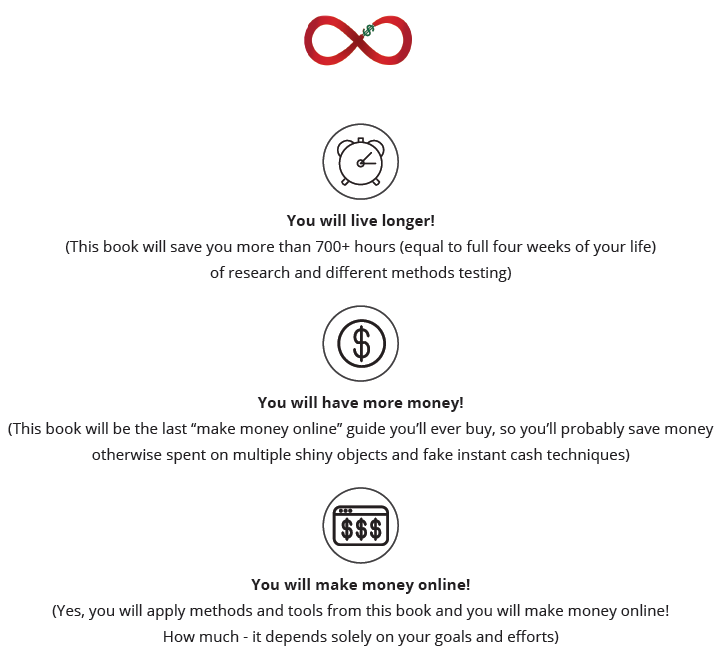 IMfinite Resources Revealed – a short e-book listing different resources like hosting, PLR products etc. Mailing List Gold – a 65 page e-book about mailing lists (from a different author). I was a little surprised by the free website that comes with the product. While it is nothing spectacular, it is also not the usual crap you get either. I know it’s not that much better, but still, every little bit counts. IMfinite is not a scam; you do get some bang for your buck. There are definitely some interesting tips and tricks in the e-book, but there is also a lot of glossing over things. As well as that the traffic generation tips are very focused on the make money niche in my opinion, focusing on things like Solo Ads quite heavily.